Homelea is a 3* Bed & Breakfast situated opposite the South Beach, overlooking the sea and promenade. Cycle storage available. Sailing, swimming, fishing, walking, golfing, riding, watersports and more available nearby. Wi-fi Hotspot now installed! Children welcome from any age. 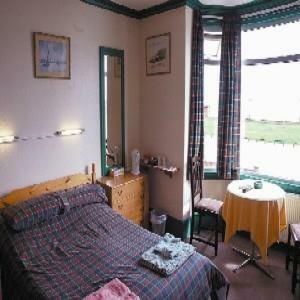 Large room overlooking seafront. Double bed and single . Situated on first floor. Arriving from south A12 at Pakefield, take 3rd exit at Water Tower Roundabout onto London Road. Continue forward, once at KFC keep in right hand lane and follow round, will take to sea front and Marine Parade. Arriving on A146, at Oulton Broad take 2nd exit onto Victoria Road, continue to Waveney Drive, at Horn Hill roundabout take 3rd exit onto Mill Road, at lights turn left and then keep to the right hand lane and follow round, will take to sea front and Marine Parade. I have stayed at Homelea for the last 12 years. It is a friendly and well run guest house. Alan and Maroulla are a lovely couple with a lot of experience of running a guest house. The room I stayed in is clean and comfy with ensuite facilities. There is a good wifi service (important in this day & age?!). Homelea is on the seafront and is within easy reach of the station and town centre. Alan's full English breakfast will keep you going for most of the day. The ingredients are fresh and sausages are butcher's quality. Thanks very much, Chris, good to see you doing so well, long may it continue.